This asset was created for a project that my good friend Paul (koromakesthings.com) and I were making for a game jam at school. We decided on the 2D pixel look for our game so I decided to try my hand at pixel art. 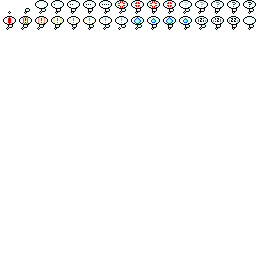 What resulted were these sprite sheets with 8 characters and some thought bubbles. The characters are supposed to be students in a class and therefore they have no body, or at least their body is very minimal. The teacher on the other hand is meant to pace up and down the screen and so I created full body animations of him moving about during his lecturing duties. Feel free to download and use the sprite sheet in your own projects. All I ask for is a little credit where credit is due. This project taught me a lot about designing 2D sprite based games. The work put into a single sprite sheet can be immense just to get the exact action you want out of the character. We could have settled for lower quality, simpler sprites, but I wanted to dive into 32-bit characters being the dingus I am. I started the project by looking at other sprites online. From that I created a base character face template for myself that I could use on all of the characters. Over the course of the project I created the sprite sheet as it is (about 4 hours a day) and spent the time creating some GIF images from them as well. Here are a couple GIFs running their animations. Click on the image below to download both sprite sheets. If you are interested in checking out the game these sprites are used in click here!